Nancy was a teacher for 37 years and a pastor’s wife for 30 years. She has 2 children, 5 grandchildren, and she is a volunteer at Sharing Life. She feels that Sharing Life makes a difference by providing people with basic needs such as food, furniture, and clothing. For the past 5 years, she has worked in various areas such as intake, distribution of food, clothing, the front desk, and greeting/directing people. Nancy loves that clients’ necessities are met with respect, compassion, and dignity. She has observed, while serving senior adult clients, that before clients even asked for help, the staff has already offered them comfort and encouragement in greeting them and asking them how they can help them. The staff attempts to ease their minds with the message that after a lifetime of hard work serving and providing for their families and friends, it is okay to allow others to help them now. Nancy says that gives her a warm feeling inside because it takes the focus off herself and puts it onto others. Laura has had a hard life. Her biological mom died when she was a teenager. After her mother’s death, she was adopted, but her adopted mom passed away shortly after due to medical issues. She then lived with her aunt for several years before moving to an apartment. Unfortunately, her apartment burned down a few years ago, which resulted in her moving to a one bedroom apartment with her two kids. But, she still needed help. One day, desperate for help, Laura went walking in the pouring rain in search of a church that might help her. The first church she came to just so happened to be Nancy’s church. As Nancy met with Laura, she began telling her about Sharing Life, including all the services available to her there. Subsequently, Laura, became our client. Since then, we have provided her kids backpacks filled with school supplies, as well as food and clothing throughout the year. Additionally, we helped her replace furniture destroyed by fire in her previous apartment. Through parenting classes offered at Sharing Life, Laura says she better understands how to discipline appropriately by utilizing techniques such as time-outs in place of yelling. She further reveals the class opened her eyes to ways she can play with her children. Laura feels that the Sharing Life staff warmly welcomes her every time she visits because they love her family, plus they recognize that her children are her number one priority. That makes all the difference for her. 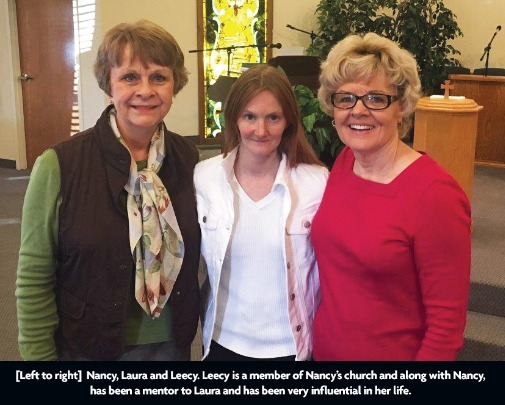 Through Sharing Life, Nancy and Laura have formed a friendship and bond that has impacted each other’s lives deeply. For Nancy and other volunteers at Sharing Life, giving back isn’t just something they do for a few hours a week, it’s who they are. For clients like Laura, Sharing Life isn’t just a place they go for help, it’s a community that truly cares for them. Sharing Life volunteers demonstrate compassion and focus on something bigger than themselves, thus providing a sense of safety and family for clients who are in need. Are you interested in helping to change someone's life by volunteering at Sharing Life? Please fill out the form below and we will contact you soon. Thank you for your heart to volunteer and serve those in need! Make a donation to Sharing Life here.